Serving Miami-Dade, Broward, Palm Beach, and Monroe Counties. Contact levy Learning Center (305) 496-7208. Arrange an assessment or free screening. 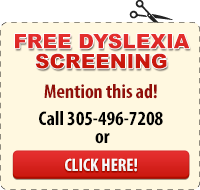 Levy Learning Center is the number one dyslexia learning center and dyslexia reading program in South Florida. Lexicon means language, and dys means lack of. Dyslexia is a reading disorder which can be characterized by poor word reading, poor reading comprehension, poor spelling, or poor auditory processing of language. It can be one, some, or all the above depending on the student. These children have reversal issues of either leaving out letters: result / reslt (common reversal), addition of letters: fammilliar / familiar (addition reversals), substitution reversals: together / togathur, or reversals: left / felt. These do not always occur consistently. However, they are slow readers and usually read the word by the general configuration rather than sounding it out (the grapheme/phoneme connection). Levy Learning Center’s dyslexia training program addresses this issue. In just 36 hours of Levy Learning Center intervention tutoring, students make up for two grade levels through our Orton-Gillingham programs. Through the multisensory presentation avenue, every pathway to the brain is tapped to ensure the student receives a strong reading foundation. Our dyslexia specialists are trained in the Orton-Gillingham method, providing dyslexia programs for children by addressing the visual, auditory, and kinesthetic approach. The Strategies for Success program at our dyslexia tutoring center treats the language of reading. Students receive dyslexia training and learn to visualize and form pictures in their mind of what important details to remember of the text they read, dyslexic students usually tend to memorize what they read and have difficulty identifying the important details of the passages they read. In addition to having trained Lindamood Bell tutors, we have dyslexia tutoring software to reinforce this method like a one-on-one tutor for the dyslexic student. Through the drill and practice and instant feedback, the student learns to summarize what they read, and recall the important details. It also allows them to write summaries. Once the strategy is learned the student can answer any common core reading comprehension question. The multisensory leveling system develops engagement, excitement, and promotes a hard work ethic for the student. Levy Learning Center dyslexia training institute also provides dyslexia summer school for students, a dyslexia tutoring program that will give them a much-needed boost for the following school year. Levy Learning Center offers specialized small group and one-on-one tutoring for students at all grade levels using research-based, mutli-sensory techniques. We start with an assessment of each student to gain a sense of his or her strengths and weaknesses and the kinds of methods that are most appropriate for that student. We then put together a diagnostic and perscriptive plan for that student that is customized to his or her needs, and then match that student with one of our instructors who is specifically trained in the most appropriate methods. Levy Learning Center offers several intensive two-week, small group summer programs. To learn more, click here. With our multisensory and research-based strategy software, you can improve up to 2 grade levels! 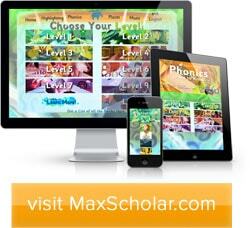 MaxScholar programs are the solution for struggling readers. We use cutting-edge software to improve word recognition skills, reading comprehension, writing and study skills.